The following are excerpts from the introduction and chapter one of the book “Wings Over San Antonio” by author, historian, artist, and Dee’s good friend Mel Brown. “San Antonio’s Fort Sam Houston was chosen as the site for the Army’s early aviation efforts when Lt. Benjamin Foulois” (see photo above)” and a small group of enlisted men were ordered there in 1910. They brought with them a Wright Brothers’ Flyer, which was designated Army Signal Corps Aero plane #1, and began flying it from the north end of Cavalry Post parade ground in March of that year”. 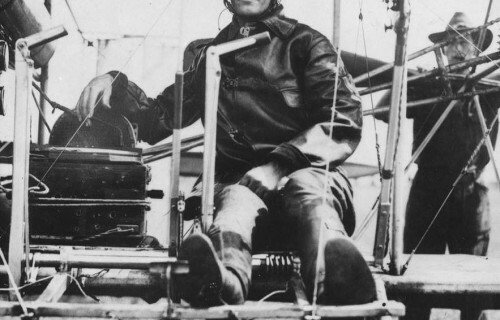 More specifically, the first flight was on 2 March 1910.